Home completes a year Sensational Jemimah sports Sports: Sensational Jemimah completes one year in international cricket! Sports: Sensational Jemimah completes one year in international cricket! What a rise it has been for Jemimah Rodrigues who made her India debut a year ago against South Africa. And the girl from Mumbai made known her happiness on Twitter. “throwback to my first runs in international cricket. I still can't believe that it's exactly 1 year from where I debuted for India. I'm so grateful to Jesus and all those people who helped and are still helping me chase the dream!” she wrote. Jemimah has climbed the rungs of international cricket rather swiftly. Since making her debut, Jemimah has gone on to break and few records and is now the World 2 batswoman. She became the first Indian girl to hit 3 sixes in an over during a match against Sri Lanka in their T20 series in September last year. 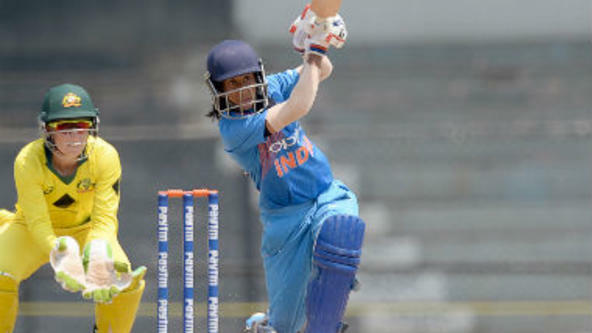 The 18-year-old was the highest scorer in her debut T20 series against South Africa last year. She made her ODI debut against Australia and although she was dismissed for 1 in that match, she scored her maiden ODI century in that series – playing as opener. Her best performances have come as opener – in the ICC World T20 last year she scored her only half-century (59 off 45 balls) to become the youngest to score a 50 in World T20 tournament. It was as opener that the youngster scored those three sixes in an over against Sri Lanka. She finished as highest scorer of that series with 191 runs in four innings. Jemimah has had her run of low scores but she fought it out. She was kept in and out of the squad and her batting position changed a number of times but that did not deter her and she came back strongly. In the recent-concluded series against New Zealand, Jemimah scored 132 runs in the three-match T20 series. Her stupendous form saw her reach the heights of success and become the World No 2 player in T20s. We wish her more success!